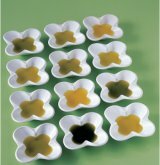 We have just finsihed our 2007 olive harvest and these oil look and taste fantastic. All olives are handpicked from single estate, single variety trees and cold pressed to capture maximum flavour of the oil. More info..
We are proud to announce that at the 2005 national Olives New Zealand awards, Echo Valley Olives EVO Verdale olive oil was awarded a gold medal and EVO Koroneiki olive oil was awarded a silver medal. Ever want to know how we make our award winning olive oil? Due to popular demand we have decided to run farm tours (including tasting) through our olive grove. Tea and coffee available, wheelchair facilities. Cuisine recommends Echo Valley !!! In Cuisine's March 2005 issue, Our Pendolino oil was rated as one of the best "Intense Oils" in New Zealand. "Strong aromas of fresh herbs (spearmint, mint and thyme), with cedar and radish. A wasabi-like flavour that “keeps on coming”, gets around the tongue and into the corners of your mouth – “a real kicker”, with caramel and citrus notes. Gold medal." Echo Valley Olive Oil strikes Gold!!! We are proud to report both our 2004 pressings have been awarded gold at the National Olives New Zealand 2004 awards. Our EVO Pendolino and Leccino were both awarded gold in the boutique single varietal category. This was our first pressing and we felt we had something very special. Come and sample our award wining olive oil at the Whangarei growers market every Saturday morning(1 hour north of Auckland). 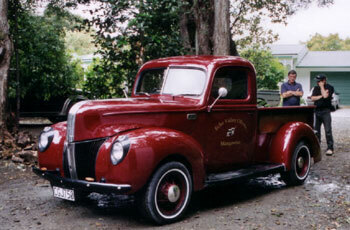 While you are there, check out our newly restored truck. Call Don on 021 1844598 for more information on the market and the truck.